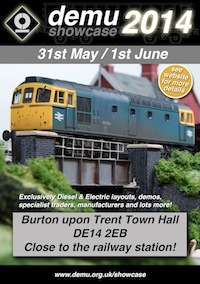 DEMU Showcase is the premier UK exhibition dedicated to diesel and electric modelling and will be on the weekend of 31 May & 1 June 2014. The Town Hall is situated very close to the railway station in Burton upon Trent. There is a public car park at the Town Hall, please be aware that East Staffs Borough Council have recently made this a pay and display car park. More details of the layouts can be found here. The following traders are confirmed in attendance.